"This is an interesting article which I came across in Modern Motor magazine, January 1960 edition, on the subject of the then still current model Mercedes-Benz Type W180 Ponton ("Roundie") 220S sedan. These vehicles were manufactured locally in Australia thru 1960. 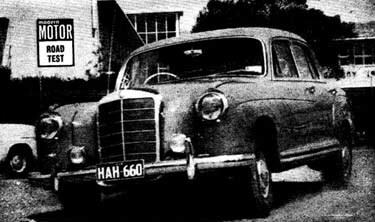 The new "Finnie" (Heckflosse) model Mercedes was not yet due for introduction to the Australian market until early 1961 due to right-hand-drive tooling and local assembly of the W111 to come on line. The article writer has issues with the Hydrak semi automatic clutch, but gives rave reviews to the car all the same." Mercedes 220S saloon is a masterpiece of a car, says Bryan Hanrahan - but he wishes the test job had been an ordinary transmission model. Plenty of instruments set in a polished wood dash. Sliding controls at right work heater-demister. I like carriage comforts, fast cars, and cars that can take the rough with the smooth. Therefore I like the Mercedes 220S, which combines all these things in one compact, handsome package and combines them better for its function than any other car I know. The 220S is Mercedes' idea of a family car: and though it can do 100 M.P.H. and handles like few other things on four wheels; it is basically just a family car. Wish I'd been born into the right family. The automatic hydraulic clutch fitted to the test car was an abomination. This is not because of any purist streak in me, but because the slipping action made so much horsepower unusable. This power-pirate is a fluid flywheel arrangement plus a hydraulically operated clutch. A touch on the column gearshift and its drive is broken. Release and it takes up again. There's no clutch pedal, of course. The instruction manual has a special section on driving with a hydraulic clutch. It tells you to go easy on gear-changes, and leaves you with the impression that Daimler-Benz is rather sorry they fitted the thing anyway. If that is their feeling, I share it. Next disappointment is the lack of central armrests back and front. The 220S is a fast, fully six-seater. Unless there are six aboard, a bit of fast cornering has people sliding all over the bench seats. Lastly, there's the rubber mats on the floor. I KNOW rubber is more serviceable than carpet. You expect to find it in a £650 Goggo, but NOT in £2852-worth of Mercedes. Like linoleum in a bridal suite. But apart from this strangeness, what is there to grumble at? Boot is large and uncluttered. 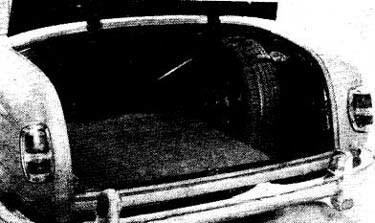 Spare and tools don't obstruct luggage. Sit behind that polished-wood dash, better built than any sideboard you're likely to be able to afford today, and take a good look around. The wide strip speedo, (with total and trip mileage recorders) spreads across the dash in the right place for quick consultation. Good thing, too. When you're sliding along in the Mercedes silence, you can misjudge speed badly. Below the speedo, from left to right, are water temperature, oil pressure and fuel gauges. Below these is an array of anonymous knobs and switches. I like 'em anonymous: if you can't learn them off by heart, you don't deserve a Mercedes anyway. Among the knobs is one for a two-speed heater blower. The other heating, demisting and fresh-air controls are set at extreme right and left of the dash, and are separately adjustable. A couple of vents with flaps above these controls direct warm air on to the side windows for demisting or fresh air on to your face to blow away the smells of a city traffic jam. And, of course, there's a clock: its tick is almost offensively loud, even at 60 mph. Windscreen wipers are two-speed electric, but no screen washers are fitted as standard. Should be, at that price. The horn ring rotates to work the flashing turn-indicators, which are NOT self-canceling. Can't understand that little shortcoming either. Interior lights work off all four doors, supplemented by a dash light that works off the front doors. Key-starting is employed. 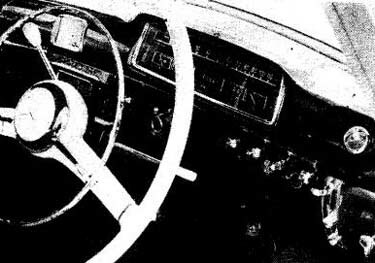 The key also operates a steering-wheel lock for thief-proof parking. Press a stalk lever under the wheel and the headlights flash. This signal is used by Continental drivers politely to inform other motorists that they are about to be overtaken at night. Don't use 'em here, because the police are just as likely to give you an unroadworthy sticker for faulty lights. There is, of course, a cigar (NOT cigarette) lighter to round off the luxury. "So what!" you say. "Who wants all this luxury?" O.K. Read through the list again. Not one of these items fails to help make you a safer, better, more comfortable driver. This is not the luxury run riot in a one-off leopard-skin-upholstered Rolls for a maharajah. It's a different brand. I call it functional luxury. True, you would do away with the wooden dash and door cappings, but the wood is so perfectly shaped and polished it looks like metal anyway. A bit of body lean on a hard corner, but the four independently sprung wheels bear firmly on the road. The engine is a superbly engineered straight-six with overhead camshaft. For its over-square, 2195 c.c. capacity it puts out 120 b.h.p. gross at 5200. Compression ratio at 8.7 to 1 is high, like the revs. But with precision engineering of Daimler-Benz standards, I don't think you have to worry about blowing the thing up or even wearing it out. This engine spins as freely as any I know. It went to 6000 on my Vane electric rev. counter several times without seeming to mind at all. On the acceleration and speed runs it never fussed. One good reason is a heat exchanger that keeps the engine oil at the right temperature, a very good thing that by no means all high-performance engines get treated to. Suspension is of the classic Mercedes pattern. It takes the form of double independent wishbones, coil springs and a sway-bar at the front and a low-pivot swing-axle, radius arms and coil springs to give an independent back end. This combines a high roll centre with a fantastic unladen ground clearance of nine inches. The brakes are servo-assisted, with finned drums. They are quite the most indestructible stoppers I've come across. I did three stops from 90 M.P.H., one after the other, as quickly as I could recover road and speed. Absolutely no fade! A recirculating-ball steering set-up gives very light wheel action and a damper in the three piece track-rod layout smoothes out road shocks without taking away road feel. There you have it. A completely conventional layout, but blessed with the magic touch of Daimler-Benz engineering. It's just that much better. Apart from that wretched clutch, this whole car is a compliment to the art of driving, and an abiding encouragement to all who aspire to drive well. Despite the clutch, the 220S shot from 0 to 60 mph in 16 seconds. Dead flat-out she turned in a four-way average of 100.5 mph, and those brakes would stop the car from 30 mph in 31 feet any time and every time you cared to try. I understand the new model (Heckflosse) Mercedes, due here early next year (1961), has an "improved" back suspension. I suppose Daimler-Benz have glue pouring over the hack tyres, or something like that, because I can't conceive of mere engineering design improving the car's road holding. The 220S weighed in at 3200 lb. 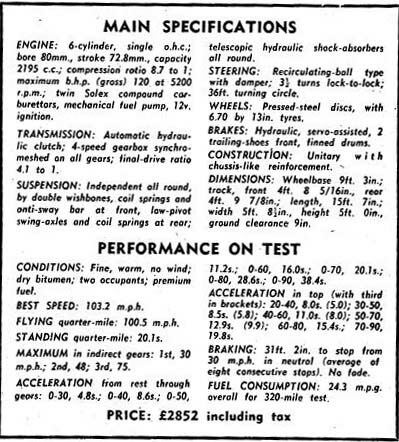 on test, yet you could throw it around like a Healey Sprite. Twist the wheel carelessly, or touch the brakes on a corner and the 220S was unshakable in its stability. The 13 inch wheels don't give the best ride on poor (average Melbourne) bitumen at around 30 mph. Small, constant deflections produce a harshness. But blast it over rough stuff, and it smoothes out like Albert Park Lake on a windless day. Fuel consumption was interesting: 24.3 mpg over 320 miles on the new super. That figure takes in all the testing, and a run up to Eildon from Melbourne. I'd call it a low average for all but constant city traffic driving. Price is interesting too. The 220S with that clutch costs £2852, tax paid. I can't think, though, that you pay anything for the name. To my mind, this car returns in kind value for every pfennig...except for that clutch. And (thank heaven) you can also buy it with ordinary transmission for £92 less, too. One Mercedes-Benz 300d = 295 average weeks wages, or 5 years, 7 months work!